The World Bank’s new Women Entrepreneurs Finance Initiative: Recycling a broken model? Is Ivanka Trump’s We-Fi initiative for women just for show? 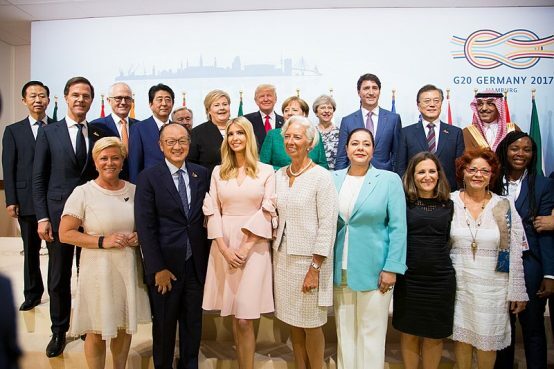 In July at the G20 meeting in Hamburg, the World Bank announced the Women Entrepreneurs Finance Initiative (We-Fi), a financial intermediary facility housed and managed by the Bank, that seeks to “advance women’s entrepreneurship” in developing countries by providing “increased access to the finance, markets, and networks necessary to start and grow a business”. The brainchild of Ivanka Trump, daughter of US president Trump, the facility aims to “leverage donor grant funding of over $325 million and mobilize more than $1 billion in international financial institution and commercial financing, by working with financial intermediaries, funds, and other market actors”. The Bank will act as We-Fi’s trustee and secretariat whilst, “Multilateral development banks, including the World Bank and IFC [International Finance Corporation, the Bank’s private sector arm], are eligible as implementing partners to propose private and public sector activities”, and apply for funding. A governing committee, composed of the founding donors, such as United Arab Emirates and Saudi Arabia, will make its allocation decisions. The first meeting of the governing committee is planned in October 2017. In July, Devex reported concerns that “We-Fi’s mission will overlap” with pre-existing initiatives such as the joint IFC and Goldman Sachs’ Women Entrepreneurs Opportunity Facility (WEOF) and the Banking on Women program (see Update 85). While We-Fi is dubbed, “the first World Bank-led facility to advance women’s entrepreneurship at this scale”, the IFC’s 2014 WEOF press release stated that its 10,000 Women programme, comprised a $600 million global facility, would, “increase access to finance to as many as 100,000 women entrepreneurs in emerging markets”. It further stated that it “is the first of its kind to be dedicated exclusively to financing women-owned small and medium businesses in developing countries”. 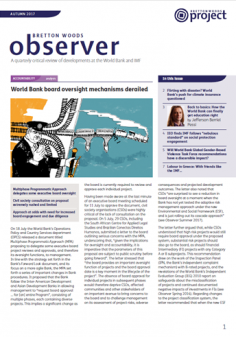 In July, Nancy Lee of the Center for Global Development (CGD) raised questions about how the success of We-Fi and the previous Bank initiatives are measured, stating that, “It would be helpful to know more about the track record of IFC’s WEOF so far”. There are no updates available on WEOF, which makes it difficult to assess the outcomes of the programme and use lessons learned for We-Fi. Cindy Huang of CGD made detailed suggestions in August on how We-Fi can learn from existing research on women’s economic empowerment, reminding the Bank that, “a well-designed approach to empower women must recognise and incorporate the rich evidence base that supports the connections between economic outcomes for women and investments to improve their health and education, decrease gender-based violence and unpaid care work responsibilities, and promote women’s voice and agency in advocating for their own rights” (see for example GADN Breaking Down the Barriers). Huang questioned whether the Fund will reach poor women, stating that “women who own SMEs [small and medium-sized enterprises] are not among the poorest segments of the population”. Elaine Zuckerman of Washington-based NGO Gender Action also expressed concerns about the facility’s target audience, saying: “While We-Fi may empower some women it is questionable whether it will contribute to achieving the Bank’s goal of ending extreme poverty. We-Fi loans will target small to middle-sized enterprises, which evidence shows fail to reach poor women. We-Fi aligns with the Bank’s ‘Gender Equality as Smart Economics’ framework that supports female enterprises as instruments of economic growth without complementarily promoting women’s and men’s equal human rights” (see Observer Winter 2016).